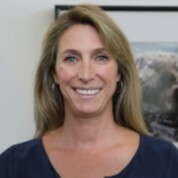 Christine Kreuder Johnson is Professor of Epidemiology and Associate Director of the One Health Institute in the School of Veterinary Medicine at UC Davis where she directs the EpiCenter for Disease Dynamics. Her research activities focus on zoonotic disease spillover and spread dynamics, epidemiologic drivers of zoonotic disease transmission, ecosystem level processes that impact wildlife population health and emerging infectious diseases, and mechanisms underlying species declines. She provides epidemiologic support to national and state agencies during unusual outbreak events and has developed and implemented risk-based approaches for surveillance and standardized risk assessment to enable systematic data analysis across a range of field studies from the local to global scale. At UC Davis, her accomplishments include the design of core didactic instruction in one health, ecosystem health, and population health for graduate and professional degree programs and primary mentorship to over 45 graduate students and post-doctoral scholars. Since 2009, Professor Johnson has served as epidemiologist for USAID’s Emerging Pandemic Threats PREDICT project, optimizing global surveillance activities to identify infectious disease threats at high-risk animal-human interfaces and working with host country governments and international organizations to meet global health priorities. Since 2014, she has directed surveillance activities for PREDICT to implement concurrent animal and human sample and data collection needed to detect disease spillover, amplification, and spread and inform risk mitigation strategies.